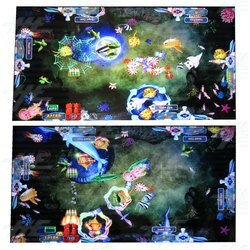 The Seafood Paradise 2 Game Board is a 6-8 player PCB featuring marine-styled graphics in a fish hunter game that has experienced immense popularity among players. This game board is currently used in the follow up version of Seafood Paradise, and this second installment game can be used to replace boards in current machines, or, it can be used to update any number of 6-8 player fish hunter arcade cabinets. The board is compatible with 6 player and 8 player cabinets, operators simply need to adjust the number of players on the game board itself. This allows operators more variety from a single board. This Seafood Paradise 2 game board is also upgradable for bill acceptors and thermal printers, and there is no need to grab any extra parts to make it work. With this English version board it can be directly connected from PCB to IO board to the acceptor or printer - very easy and simple, and much less mess inside your machine! The game itself comes with a number of fun features to keep player entertained and coming back for more chances to win! The main difference between this version and its predecessor is that it has removed the Spongebob character feature, replaced one of the special weapons with a Power-Up feature, and added loads of new fun and exciting features, including new fish types! This game board is currently used in the follow up version of Seafood Paradise, and this second installment game can be used to replace boards in current machines, or, it can be used to update any number of 6-8 player fish hunter arcade cabinets. The board is compatible with 6 player and 8 player cabinets, operators simply need to adjust the number of players on the game board itself. This allows operators more variety from a single board. This Seafood Paradise 2 game board is also upgradable for bill acceptors and thermal printers, and there is no need to grab any extra parts to make it work. With this English version board it can be directly connected from PCB to IO board to the acceptor or printer - very easy and simple, and much less mess inside your machine! The game itself comes with a number of fun features to keep player entertained and coming back for more chances to win! The main difference between this version and its predecessor is that it has removed the Spongebob character feature, replaced one of the special weapons with a Power-Up feature, and added loads of new fun and exciting features, including new fish types! Chain Lightning - Creates a chain between many fish on the playfield and causing damage to a large number of fish.